With Readly you can read Linux Mint Complete Manual and thousands of other magazines on your tablet and smartphone. Get access to all with just one subscription. New releases and back issues – all included. 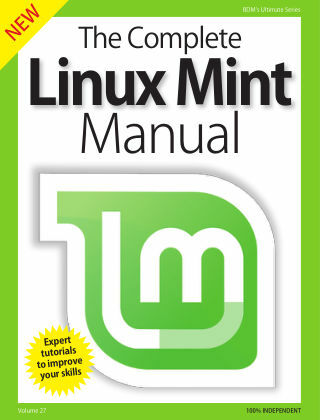 The ultimate independent user manual for the Linux Mint OS! Linux Mint is an exciting distribution of Linux that brings together everything that’s great about the operating system. With this book to hand, you’ll be introduced to the dfferent editions of Linux Mint, what the advantages and features are of each edition and how to install and how to use Linux Mint. Linux Mint is an excellent foundation on which to build your computing knowledge and skills. It’s a superb everyday desktop and media machine and offers a secure and safe environment for you and your children. Linux Mint is freely available to download, install and use. So if you’re thinking of trying out Linux, then Linux Mint is the ideal starting point. This book will help you down the road to becoming a Mint Master. 100% unofficial.